Happy Birthday Uncle Joe! Today is my uncle’s birthday and we started off his lavish celebration with breakfast at McDonald’s. Not that this was his birthday wish, but it was located right across the street from our motel. We topped off the tanks next door, and were pleased to see a new outfitter that had just had their grand opening across the street. It was called “Orange Nation” and they had everything we needed for our Hip Hop and Urban style. Unfortunately, we didn’t have time to stop & shop. As we got back on the Interstate and headed west out of Albuquerque, a handful of hot air balloons were taking off. About 25 – 30 years ago, my family came to Albuquerque for the Balloon Festival, and that is something I definitely would like to do again. We had sunshine and clear skies for our drive across western New Mexico but there was plenty of evidence of their recent snowfall. 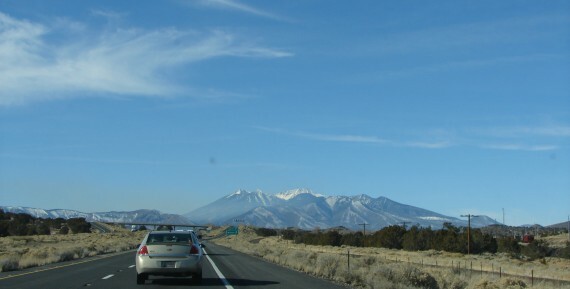 The drive across western New Mexico has great scenery. When you think about the southwest and visualize mesas in the distance, you are thinking about New Mexico. It is also a great state if you like your highways straight. Much of the time the road disappears as a speck in the distance and the road is just as straight as can be. We passed the time in our van by working on our rap song. Miles worked the drum pad, while Mallory, Marissa and I came up with the lyrics. Stephanie was blissfully ignoring us with her nose stuck in a book. I expect several performances of this masterpiece for the entire family before this trip is complete. We made a stop at the Welcome Center as soon as we pulled into the state. They had a contest of sorts on a wall, where visitors could write down their predicted score of the Fiesta Bowl and post it on the wall. Their sign promoting the contest read: Ok State Cowboys vs Sanford Cardinals. Scott pointed out to the staff that it is really the Stanford Cardinal but they didn’t see too interested in correcting their mistake. 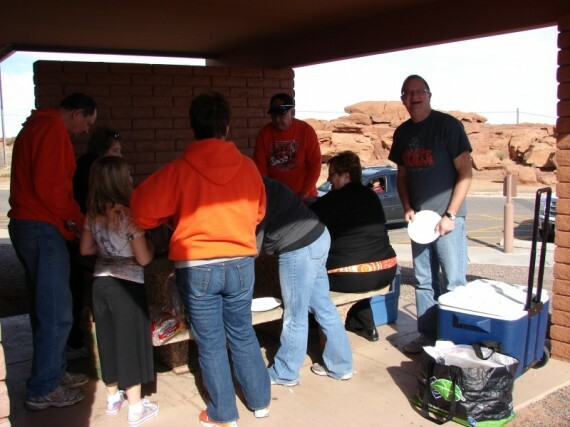 We pulled over at a rest stop in eastern Arizona, and the weather was so nice we decided to stay for a picnic lunch. We are amazed at Miles’ ability to not use the restroom. We finally coaxed him out of the van for the first time today, when we stopped here for lunch. There were plenty of rocks for climbing and almost everybody in our group got into the act. KK and Mallory. Showing us their peace signs and kissie faces. 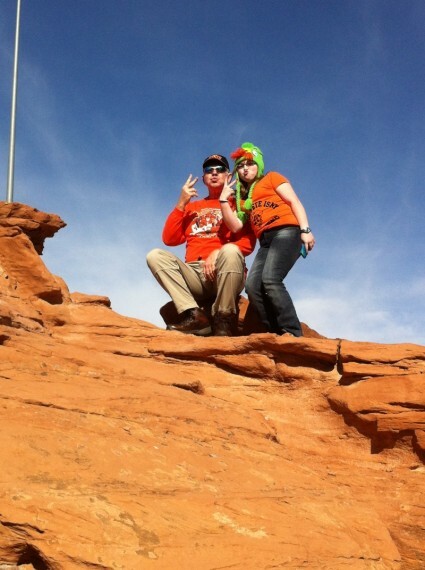 A Guinness World Record for peace signs & kissie faces. One of the neat things we enjoy about driving our multiple cars together is that KK provides two-way radios. For this trip, we have three such radios so we can all stay in contact. As we were nearing Flagstaff, PK (in the lead car) got on the radio to say she was admiring the artwork on the side of a semi-truck and the driver waved at her. This inspired Mallory, who was riding in the passenger seat of our van, to encourage the truck driver to honk at us as we passed him. He did! Mallory is such a great communicator! Once we hit Flagstaff, we took Highway 89 south to Sedona. This was a scenic drive along some twisty roads that mostly went along the bottom of a valley next to a creek. There were some gorgeous rock formations, but when we found out we had to pay $10 a car to park and look around, we decided to pass on the opportunity. We made our way into Sedona where traffic on the highway quickly came to a halt. The highway turns into Main Street and we checked out the huge number of roadside shops. 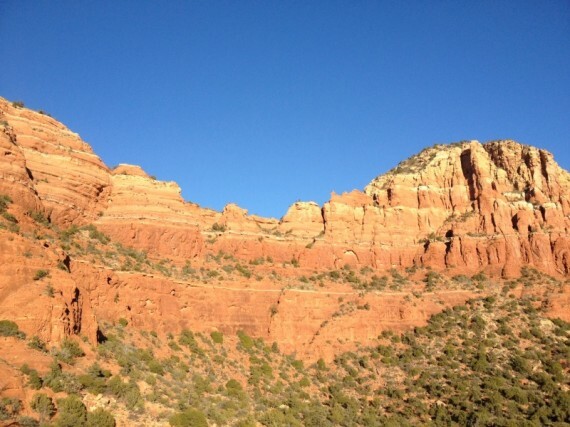 I have heard about Sedona in the past, and especially in the weeks leading up to this trip. I have two words: tourist trap. We did stop at one gift shop, but only because it had a statue of a giant chicken next to the road. When we saw that statue, Mallory started yelling for us to pull over. 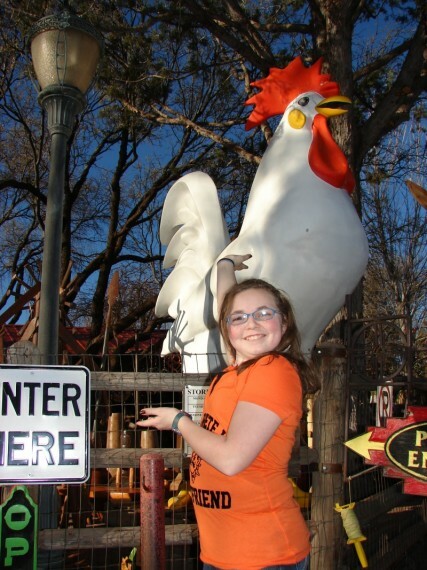 Mallory and a Giant Chicken. Specifically, a White Leghorn. 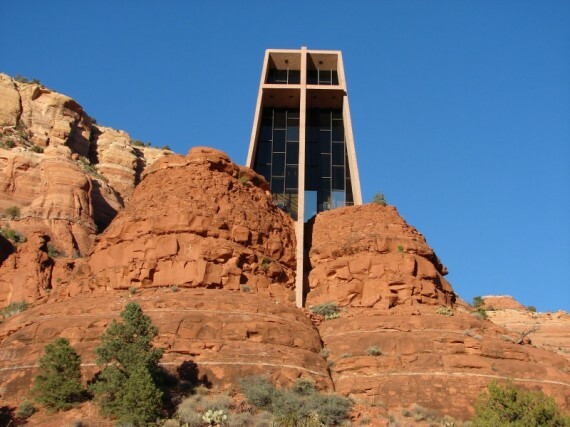 The definite highlight of our trip into Sedona was the stop at the Chapel of the Holy Cross. 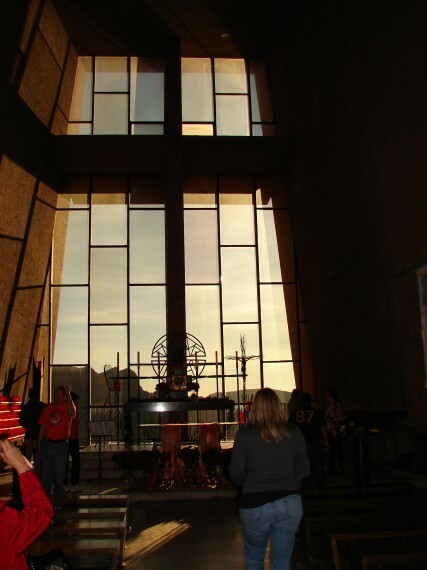 This Catholic church was constructed in the 1950s and it was built right into the rocks. There was a huge crowd there, even though we arrived late in the afternoon on a Wednesday. They even had several parking lot attendants to control the traffic. A necessary and welcome touch. This was the largest QR code I have ever seen. 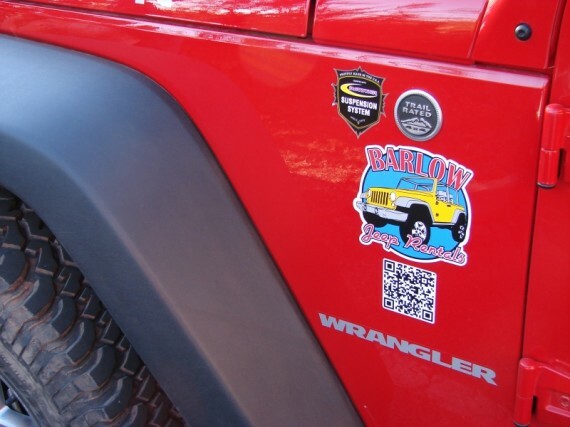 Located on a jeep in the parking lot. 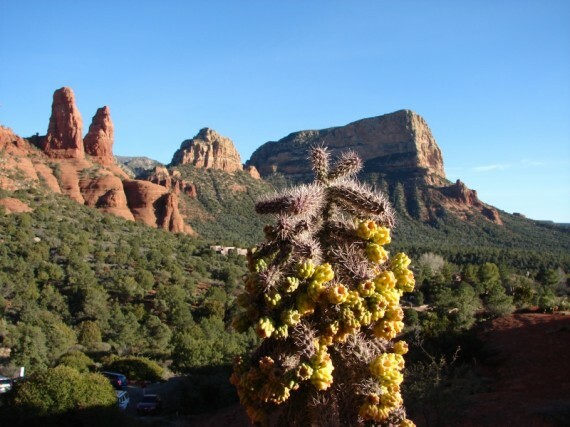 The other significant attribute of Sedona is their aversion to traffic lights. Instead, they had over a half dozen roundabouts. These roundabouts certainly stressed the driving capabilities of many of the tourists in town. 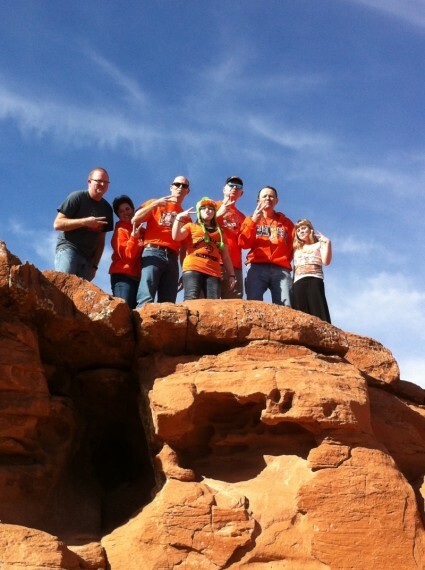 From Sedona, we caught up with the interstate and made our way quickly to Phoenix. By this point, everybody in our group was ready to be done with driving. Once we hit the Phoenix area, it took another agonizing hour to make our way to the suburb of Buckeye, where our vacation home was located. We pulled into the driveway before 7 p.m. and unloaded all of our gear. Stephanie, the kids, and I next went to Walmart to load up on groceries for the week. The rest of the crew was feeling like eating out so they found a local steakhouse that everybody seemed impressed with. Everyone was happy with our vacation home. It has 5 bedrooms, so all the adults (and Mallory) get their own bedroom. The home is tastefully decorated downstairs with 3 Picasso prints and 1 “The Kramer”. Classy! We wrapped up the evening with everyone just vegetating around the house. Being in the car for 2 straight days will do that to a person. We are so excited that we have the next 4 days to experience the Valley of the Sun. Look out Phoenix!